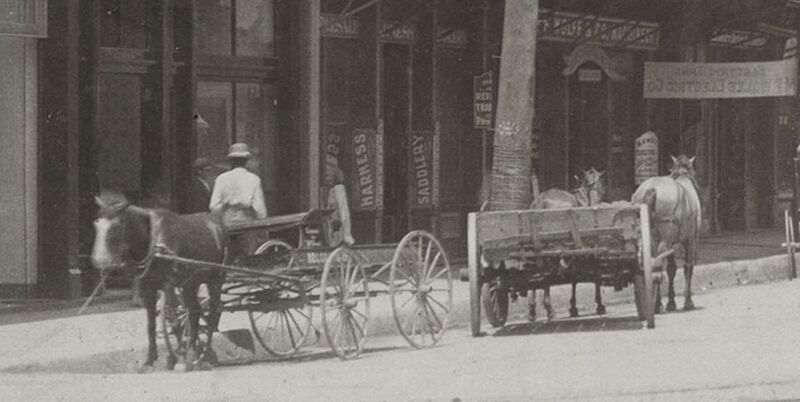 On the north side of Main (at the left), we can see horse-drawn wagons parked in front of a group of businesses including Konantz Saddlery Co., Ben F. Wolfe & Co. (machinery), a banner across the sidewalk for the Southwestern Electrical Engineering & Construction Co., Swope & Mangold wholesale and retail liquor company; then past Austin Street, on the corner, is the Trust Building, with the then-two-story Sanger Bros. building right next door (Sanger’s would build that up to six floors in 1902 and would eventually take over the Trust Building); across Lamar is the North Texas Building, with Charles L. Dexter’s insurance company advertised on the side; and, beyond, the Scollard Building, etc. 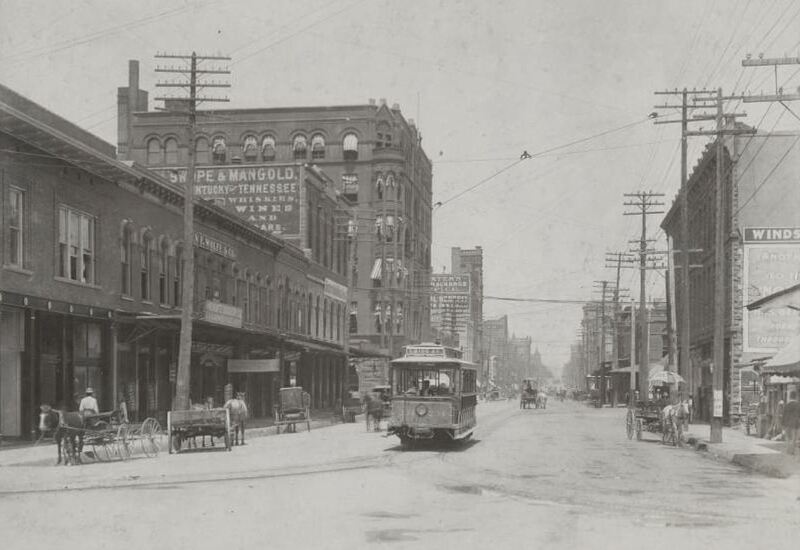 The Windsor Hotel can be seen on the south side of the street in the foreground. And in the middle, an almost empty little streetcar with “Swiss Av.” on it, moving down Main underneath a canopy of hundreds of ugly electric wires zig-zagging overhead. Let’s zoom in around the photo to see a few closeups (all images are much larger when clicked). Is that someone in the window looking down the street? 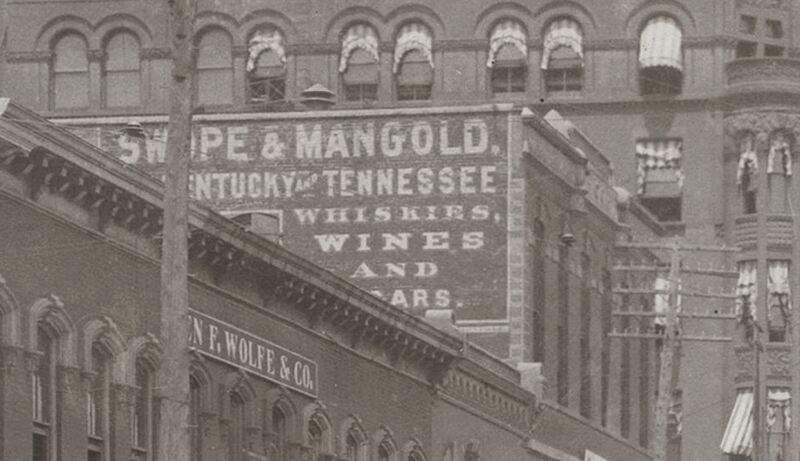 Swope & Mangold was one of the oldest “liquor concerns” in turn-of-the-century North Texas. 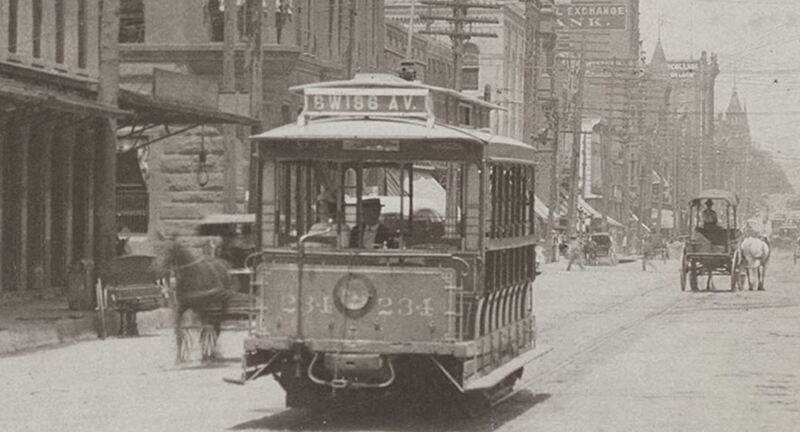 The electric streetcar shared the roadway with horses, buggies, and wagons. I can’t quite make out the writing on the umbrella or on the sign posted on the pole. Part of the old Windsor Hotel can be seen at the right. At the bottom corner is a shop that sold “notions” and household goods, and just out of frame were a fish market and a meat market. And the little Swiss Avenue car 234. Lotsa free seats. 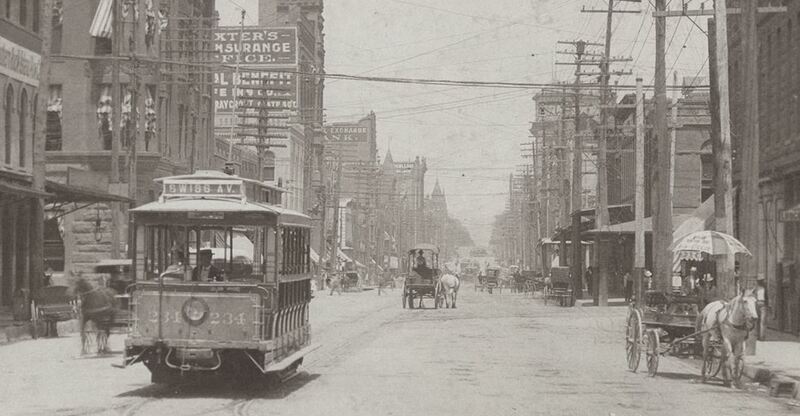 Here’s another view of Main Street looking east, taken around the same time. There’s even a streetcar in about the same spot. 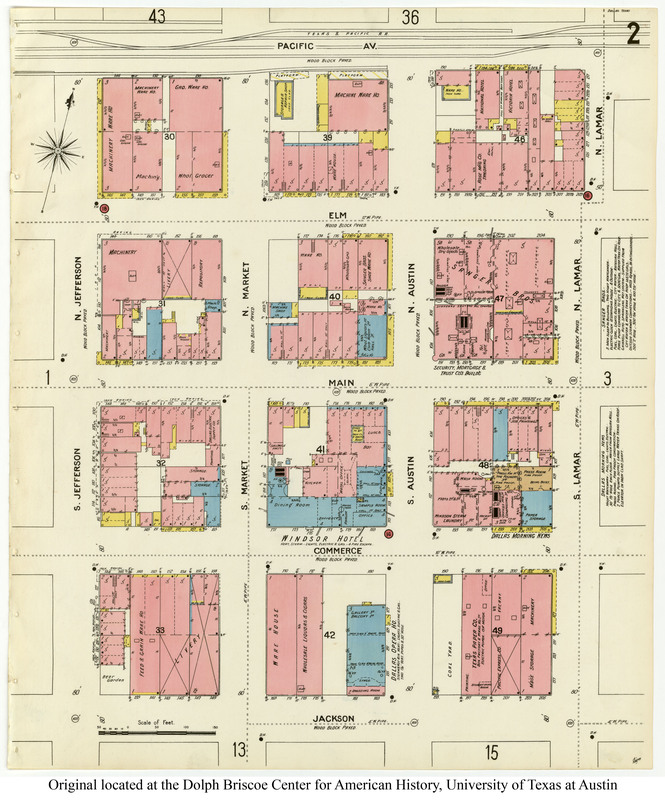 See the 1899 Sanborn map for this general area here (note that Record Street was once Jefferson Street). 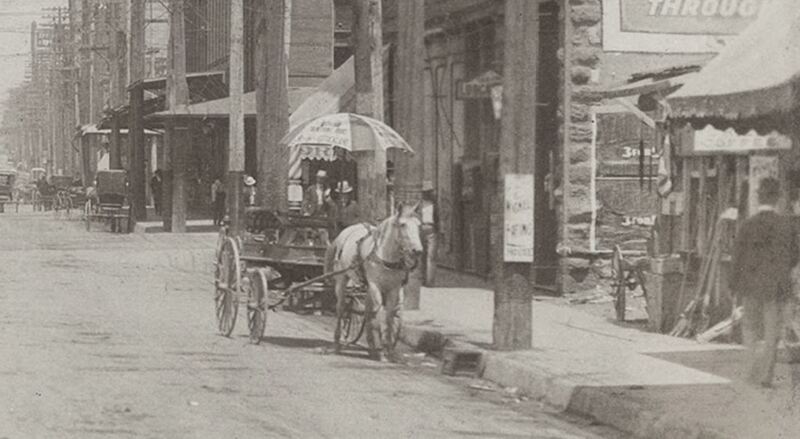 Top photo — titled “Main Street between Austin and Market Streets” — is from the George W. Cook Dallas/Texas Image Collection, DeGolyer Library, Central University Libraries, Southern Methodist University; more information on this photo is here. 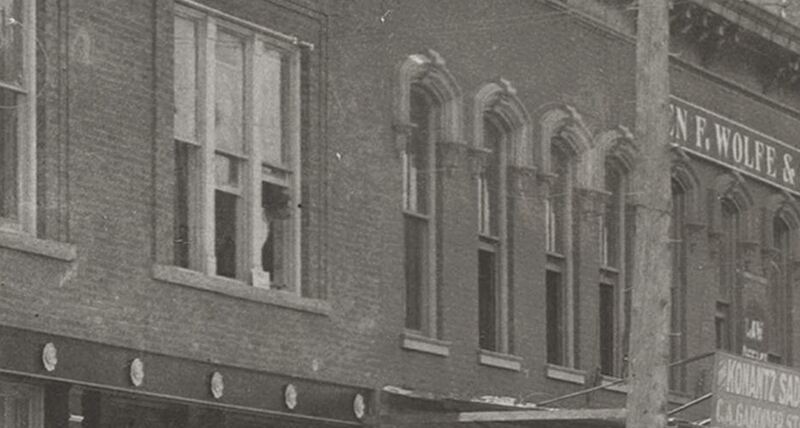 The circa-1900 bird’s-eye view photo at the bottom is from the collection of the Dallas Historical Society, found in the book Dallas Rediscovered by William L. McDonald (p. 42). You’ve got great eyes Paula. I finally saw him, and to me it looks like a slender gent with a moustache and a receding hairline. But what is the light colored thing at the bottom of the window? Is he signaling to someone? Very nice image.